SAN JOSE, Calif., April 24, 2017 /PRNewswire/ -- SI-BONE, Inc., an innovative medical device company that pioneered the use of the iFuse Implant System® ("iFuse"), a triangular shaped minimally invasive surgical (MIS) device indicated for fusion for certain disorders of the sacroiliac (SI) joint, announced the publication of a 6-year study comparing the iFuse ImplantTM to both conservative management and radiofrequency denervation. The long-term study titled Minimally Invasive Sacroiliac Joint Fusion, Radiofrequency Denervation and Conservative Management for Sacroiliac Joint Pain: Six Year Comparative Study, was published in the journal Neurosurgery. 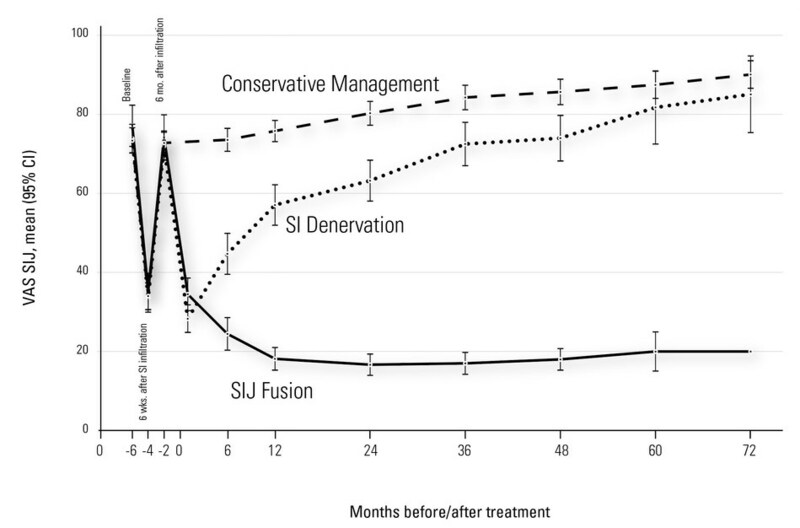 The study evaluated 137 patients seen in an outpatient neurosurgery clinic who received either conservative management (63 patients), SI joint denervation (47) or SI joint fusion with the iFuse Implant (27) for SI joint pain due to either osteoarthritic degenerative sacroiliitis or SI joint disruption. Outcomes were based on SI joint pain ratings using a 0-10 visual analog scale (VAS), functional status using Oswestry Disability Index (ODI), pain medication use and work status. Patients treated with conservative management as well as those treated with radiofrequency denervation had no long-term improvement in pain or function, and in fact got worse, whereas the iFuse Implant group had markedly superior improvements in pain (See Figure 1) and function. At last follow-up, 80% of the patients in both the conservative management and radiofrequency denervation groups were using opioids, compared to only 7% of the patients in the iFuse Implant group. At last follow-up, 70% of patients treated with the iFuse Implant had returned to work, compared to 34% of those treated with radiofrequency denervation and 19% of those treated with conservative management. Publication of results of this long-term study extends the duration of follow-up out to 6 years with the iFuse Implant. iFuse is specifically designed for SI joint fusion with a unique triangular shape that prevents rotational motion and a porous surface that promotes bony ongrowth and ingrowth.1 The iFuse Implant is the only SI joint fusion device with prospective peer-reviewed publications demonstrating safety, effectiveness and durable positive outcomes, and the only SI joint fusion device with a FDA-cleared claim that clinical studies demonstrate improvements in pain, patient function and quality of life. "An interesting observation from our study was that over one-third of patients seen in our clinic and initially treated with conservative management failed to achieve adequate pain relief and required additional treatments. Of the treatments available, only SI joint fusion with the iFuse Implant provided sustained, long term pain relief," said Vicente Vanaclocha-Vanaclocha MD, PhD, primary author of the study. "Furthermore, the fact that the treatment option provided was often decided by external factors enhanced the comparability of groups. This study offers solid evidence that the iFuse Implant is an effective long-term treatment for those patients with chronic pain resulting from certain types of SI joint pathologies who fail to respond to initial conservative management." Jeffrey Dunn, President and CEO of SI-BONE commented: "This study is remarkable in that it highlights the profound positive impact on patients with SI joint pain who have access to SI joint fusion. The opioid epidemic is a challenging public health problem in the U.S. and coverage policies that provide access to technologies like the iFuse Implant can have a meaningful impact on reducing dependence on opioids." The iFuse Implant System provides a minimally invasive surgical solution to fuse the SI joint using patented triangular titanium implants that create an interference fit within the ilium and sacrum. The triangular implant shape, combined with the press fit insertion, is designed to provide immediate fixation by minimizing rotational motion. The implants have a porous surface that provide an ideal environment for bone ongrowth and ingrowth1, facilitating long-term fusion of the joint. The iFuse Implant is the only commercially available SI joint fusion device in the United States with significant published prospective clinical evidence that demonstrates safety, effectiveness and economic benefits, including three large multicenter studies, two of which are randomized controlled trials. Currently, there are more than 50 peer-reviewed publications supporting positive clinical outcomes, safety, biomechanics, and the economic benefits of the iFuse Implant (www.si-bone.com/results).